About 10 years ago when I was going to college in Bellingham, WA I saw one of the coolest things ever. 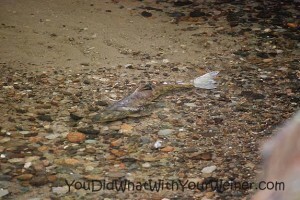 I was running through a local park and the creek was littered with the carcasses of Salmon that had finished spawning. Even though they were rotting fish (strangely, rotting fish in nature don’t smell hardly at all), it was so amazing to witness such a huge display of Mother Nature at work. I will never forget it. For those of you who don’t know, the life cycle of Salmon is really special. First, Salmon are born and then make their way to the ocean. After they swim around for one to three years they somehow manage to find the exact same stream they were born in. They then swim upstream until they find a place to spawn, fighting the current for sometimes hundreds of miles. After they lay and fertilize their eggs they die and float down the river. Their decomposing bodies create food for other animals and return nutrients to the soil. This last Friday when S said he saw a report on the Seattle news about Salmon spawning in one of our local streams I was super excited. He said they showed photos of the Salmon being so numerous that you could almost walk across their backs. I jumped at the chance to see Salmon in the spawning cycle again. Saturday morning I packed up the dogs and headed to Carkeek Park. To my disappointment, there were not hundreds of salmon in the Creek like S had described. I talked to one of the Salmon Watchers at the park and he said the fish runs hadn’t been that strong in several years. He said that the pollution in the rainwater runoff entering the stream has been too toxic for the salmon to want to return or survive. Also, several fish died when they fish got a disease a few years back. We figured that the news had shown footage from several years back for their story. I did get to see a couple of Salmon. Even though there weren’t a bunch of them, it was still amazing to see even a few. People were standing all around the stream in awe. 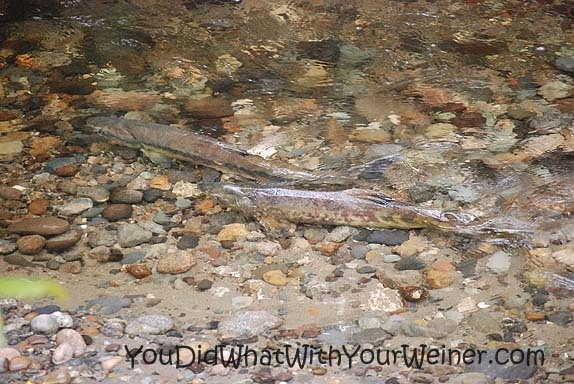 I even heard one guy in his 40s say that he has lived in the Northwest all of his life but never seen Salmon spawning in a stream. While they waited for me they did get go sniff around in the leaves a lot which always seems exciting to a dog. I bet there are a lot of “strange” smells in there. They also got to say hi to several other doggies who were tagging along with their owners who came to see the Salmon. I am sure they weren’t completely bored. I only got a really good view of two of the Salmon. I couldn’t photograph the others because they were too far away or there was too much of a glare on the water (note to self: next time bring your polarizing filter). I was able to get some clear photos of the Salmon in the pool. 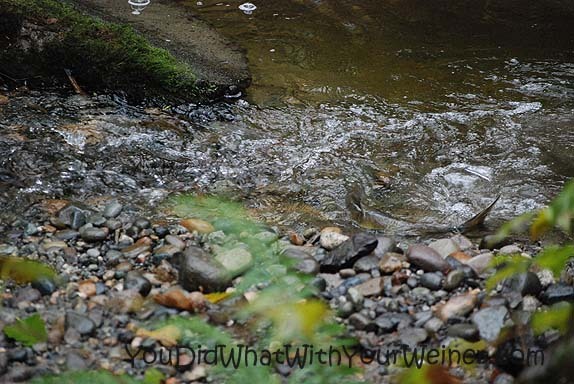 The Salmon watcher said it was a male and female Chum Salmon and that they were spawning. 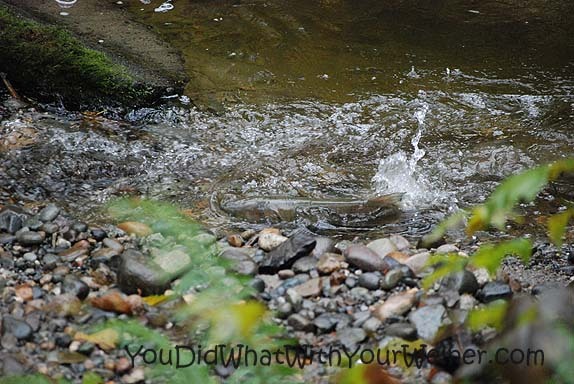 Imagine seeing two Salmon Spawn right in front of your eyes! And only 10 minutes from your house! I also got a photo of one of them as he tried to swim up one of the shallow side streams. The experience was a great way to connect with the natural world around us. I can’t wait to see the Salmon again. Have you ever seen Salmon Spawn? I certainly haven’t seen any Salmon – Chester and Gretel are lucky to have nature so close by! Great pics, well worth the wait! Thanks on the photos. There were other fish in the stream and I wish I could have gotten pics of them too. I was happy with what I did get though. That would be great to see. That’s too bad they aren’t as thick as you had hoped. I can remember the very first Salmon run I saw too and it was about 10 years ago. It’s one of the most amazing things I’ve seen – so many fish you could almost cross the stream on their backs! It’s kinda sad to see the rotting ones still trying to get up stream, but all in a good cause 🙂 Great pics! The only living salmon I have seen were in a fish farm. It was much less exciting, I can assure you. It’s too bad their numbers have decreased so much in recent years. That makes me a little worried. But I think it’s awesome you heard about the fish and then just packed up and headed out to take a look! That’s the attitude I am trying to develop as well. I am sure the dogs had fun too, even if they didn’t get a glimpse of the pretty fish. What a neat experience. Too bad the numbers weren’t higher and the dogs weren’t taller. I’ve never seen a run like that, but I love to see fish from our row boat. Way cool. Ruff! What a great experience and very nice pictures. 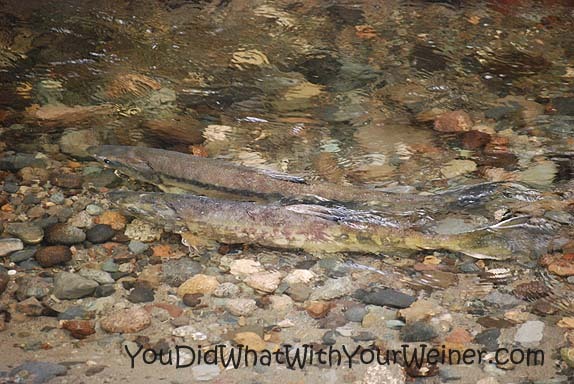 You lucky things.. have been fortunate to see spawning Salmon up the rivers in the South Island of NZ where I come from.. they always look pretty sick at that point of their life cycle tho!!! We were lucky enough to get to see Kokanee salmon spawning when we were in Lake Tahoe a few weeks ago. They were clearly a different breed – much smaller, but a lovely shade of red. It was a really special experience.